"Very reasonably priced, comfy beds, very clean!" Welcoming staff, clean, comfortable, great location, even a bar on the first floor! Met all our expectations at a great price! 21-Mar-2019 Verified Review, stayed from Thu Mar 21 to Fri Mar 22 2019 at a $69.07 average nightly rate. "Very good family hotel. Great location." "Professional, friendly service, especially at the bar." Average management, reception and housekeeping. "Rooms and bathrooms inadequately cleaned. Clean hotel facilities." "Great beds in okay rooms." Outdated, insufficiently cleaned rooms and bathrooms, with poor furniture. Inadequately maintained rooms with complaints about the A/C, minibars, and TV's. Shower can be a problem. Rated 75/100 based on reviews from families. "Professional, friendly service, especially at the bar." Reception and management are fine. Hotel was great, just a few minor maintenance problems. My HVAC was not cooling properly and while the manager managed to fix it partially, it was still not my desired temperature. Some areas of the bathroom and furnishings needed some TLC. The front desk person can make or break the experience. Alex was working when I checked in. He was great at guest service. The hotel offers breakfast and dinner service, it's one of the older style full-service Holiday Inns. The property is well maintained and the rooms were very clean. The per night price was less than I normally pay. There was a lot of noise from the freeway next to the property. Came into a cold room. Immediately turned on the heat but it didn't work so I called the manager who sent up a maintenance man. He played with the heater control for a few minutes and then left without a word. Two hours later it was still cold so I wend down to the front desk where a young man said he would take care of it. An hour later after no contact, I called him up and he said there were no maintenance people working so there was nothing he could do. Since the hotel was booked, he didn't have another room to offer. They offered to cancel my reservation if I wanted to leave but since I was with others, not an option. The manager finally offered to bring me more blankets. Comfortable room and on point service are necessary for a relaxing stay. What you described here though is the opposite of that. I'm sorry we weren't able to make you smile during your visit. But don't worry as I've already shared your thoughts with the hotel . This will enable them to step up their game and address the issues to avoid recurrence. You'll also hear from me via private message to follow-up. We promise a better experience next time, so I hope you give us another try! The parking lot was full of rental cars and service vehicles when I arrived. Also popular with Semi Fleet drivers. Plenty of parking for all. Restaurant and lounge off the lobby. Large quiet rooms currently being updated including new mattresses. Maintenance people working to make an older style hotel right for their guests. Repeat guests are greeted by the staff by name and employees take the time to visit with you. They are not afraid to ask how your stay is going and can they do anything for you. During the summer, the hotel is busier with battlefield tourists. Traffic in town can experience grid lock. This hotel location is the first stop light south of the interstate which makes the distance sitting on the main road in traffic shorter on your way to the battlefield and/or the interstate. My husband and I stayed here while we were visiting family in the area. Pros: clean, professional and polite staff, pool and Jacuzzi were good for our purposes, easily accessible off the highway. Cons: pillows were so soft that they went flat when you slept. The manual in the desk said that the hotel had various pillow options (my neck and back were in pain after might 1) and the staff seemed to have no idea what I was talking about (I took a picture of their manual), but they tried to offer solutions to help regardless. Our room was next to the housecleaning staff supply closet so all morning we kept hearing them go in and out of it, and staff talking to one another, on our second night our room wasn't serviced, there is NO COFFEE MAKER in the rooms themselves, yet they have keyring cups and sugar/cups in order to make coffee. Why don't they hsve a.coffee maker in each room? Isn't that standard anywhere else? They offer complimentary coffee on the first floor, but I often had to ask staff members to refill it, and it was often cold or lukewarm. Plus, no one wants to wake up first thing and go to the lobby to get coffee. Thank you for your review and for staying with us. We are glad to hear you found the rooms clean and our staff professional. Our goal is to ensure that each guest stay is an excellent one and can see that we have fallen short of our goal. I am so sorry for any inconvenience and for any discomfort you experienced due to the condition of the pillows. This is clearly not the representation of quality and service we want of our hotel. Your comments have been noted and shared with our management teams to ensure our guests' needs and expectations are met in the future. Many thanks for your feedback. This may not be your greatest stay with us, but thanks for choosing us and sharing your concerns. We value your input and would love a chance to make it up to you. With a stay at Holiday Inn Manassas - Battlefield in Manassas, you'll be within a 15-minute drive of Jiffy Lube Live and Manassas National Battlefield Park. This hotel is 12.6 mi (20.3 km) from Fair Oaks Mall and 14.8 mi (23.8 km) from Eagle Bank Arena. Make yourself at home in one of the 104 air-conditioned rooms featuring refrigerators and flat-screen televisions. Complimentary wired and wireless Internet access keeps you connected, and cable programming provides entertainment. Bathrooms have shower/tub combinations and hair dryers. Conveniences include desks and complimentary newspapers, as well as phones with free local calls. Take advantage of recreational opportunities offered, including an indoor pool, a spa tub, and a 24-hour fitness center. This hotel also features complimentary wireless Internet access, gift shops/newsstands, and a television in a common area. Satisfy your appetite for lunch or dinner at Twist Bistro, a restaurant which specializes in American cuisine, or stay in and take advantage of the room service (during limited hours). Wrap up your day with a drink at the bar/lounge. Cooked-to-order breakfasts are available daily from 6 AM to 10 AM for a fee. Featured amenities include complimentary wired Internet access, a 24-hour business center, and express check-out. Planning an event in Manassas? This hotel features 2000 square feet (186 square meters) of event facilities. Free self parking is available onsite. The preferred airport for Holiday Inn Manassas is Washington, DC (IAD-Washington Dulles Intl.) - 17.7 km / 11 mi. 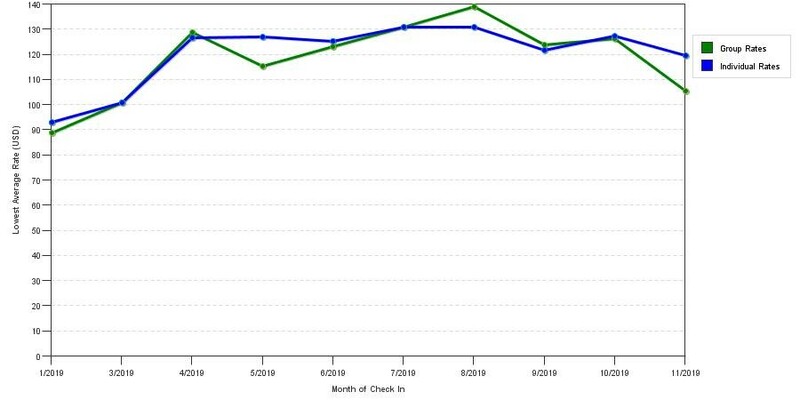 The graph above is seasonality of room rates for both group quotes and the lowest online individual rates our system could find at the time the group offer was entered. The lowest group deal shown is 20.1% in May 2018 and the highest average individual rate is $149 in the month of May 2018. This chart will show past seasonality and also project future months. If you are flexible with dates, you may want to consider staying at Holiday Inn Manassas Battlefield in a month when rates are lower.